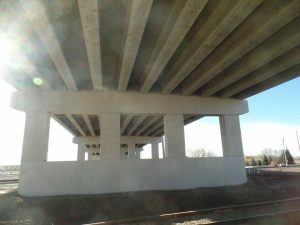 The project features a bridge over BNSF railroad tracks on State Avenue, the N-S designated truck route for Hwy. 22 in Dickinson. Other construction included replacing underground utilities, and construction of concrete pavement, MSE retaining walls, traffic signals, lighting, sidewalk, and decorative boulevards. The total cost of this project was approximately 33 million dollars. The construction began in the summer of 2015 and was completed in October of 2016. Initial construction involved rebuilding the 30 year old concrete pavement in the project vicinity. In total, almost 6,400 cubic yards of ready mixed concrete was used in paving this project and approximately 13,700 lineal feet of curb was constructed. Built alongside most of the concrete pavement is a colored and imprinted concrete boulevard. The boulevard used an integral Marigold color, and imprinted with a Dublin Cobble stamp pattern. There was also more than 67,000 square feet of 4” concrete sidewalk and driveways in this project. The boulevard, sidewalk, and driveways utilized more than 1,100 cubic yards of concrete. To establish grade for the bridge, the contractor installed 95,000 tons of select granular fill. Fill soil was contained within a Mechanically Stabilized Earth (MSE) retaining wall system covering 38,000 S. F. of vertical surface. The bridge columns used form liners to achieve an Ashlar Stone surface texture to match the wall pattern. A two coat Desert Sand colored stain system maintained color consistency throughout. The bridge deck utilized nearly 4,000 lineal feet of 45” pre-stressed I-beam bridge girders spanning a total of over 350 feet. Approximately 1,500 cubic yards of AAE-3 ready mixed concrete was used in the construction of the bridge deck. The bridge deck was poured using two concrete pumps and a bridge deck paver. The entire bridge deck took only 12 hours to pour and was done at night to minimize traffic interruptions. 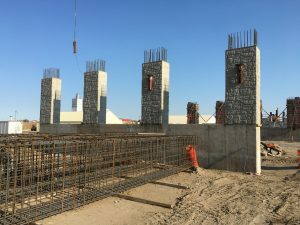 Total concrete used on this project exceeded 12,000 cubic yards. This bridge has been needed in the City of Dickinson for years as the first discussions for a project of this type were held in the early 1980’s. The final product is an aesthetically appealing bridge, new safer roadways with bright sidewalks with clean and good looking boulevards throughout. The State Avenue Bridge will also give first responders and citizens a clear route to the south side of Dickinson without the fear of being held up by a train. The bridge will serve Dickinson’s transportation needs for many, many years to come. Copyright © 2019 Dickinson Ready-Mix Co. All Rights Reserved. Website Design by Ricky Jones.